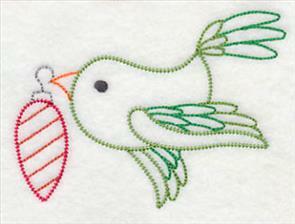 to fill the space on tea towels, pillows, and wall hangings. 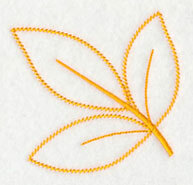 They're light and open, and few thread changes make them quick to stitch! 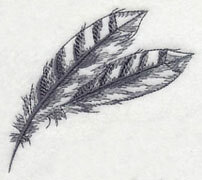 There's a vast variety of subjects, themes, and styles. 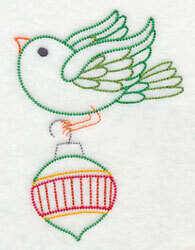 Vintage birds are decking the halls for the holidays. 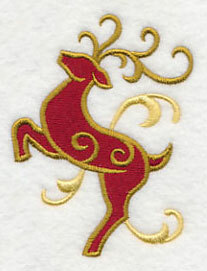 Reindeer frolic against a backdrop of elegant filigree. 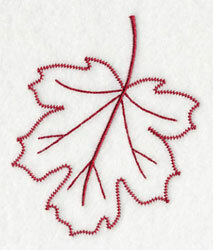 Snowflakes and leaves help transition home decor from autumn to winter. 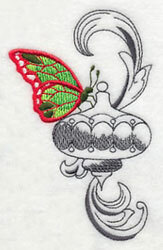 Scroll down the page to see the variety, and enjoy these new designs! 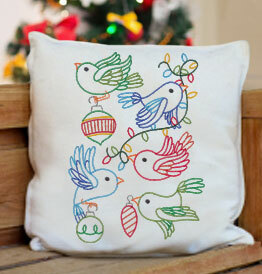 Colorful quick stitch collages add cozy, Christmas charm to home decor. 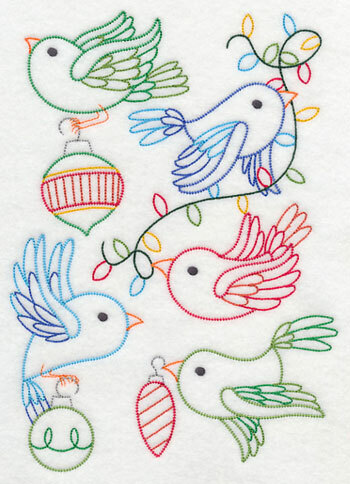 These little birds are merry and bright, ready to deck the halls, walls, and tea towels! 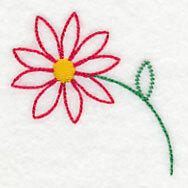 The vintage embroidery style is reminiscent of hand embroidery, but you get the speed and precision with your embroidery machine! 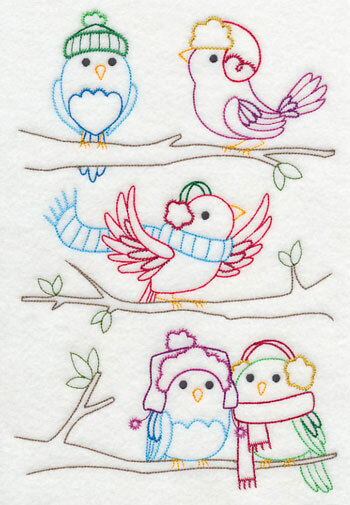 6.88" x 9.62" and 5.58" x 7.80" and 4.83" x 6.76"
The little birds from the above medley have been separated out, and are available for individual purchase. 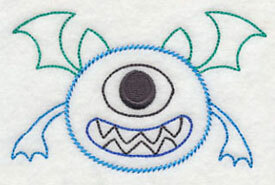 Use them in conjunction with the larger design! 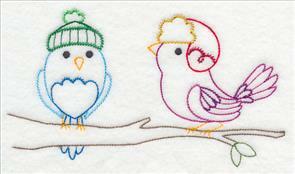 Embroider the collage on a placemat, then stitch the birds on the corner of a napkin. 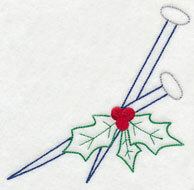 Or, embroider the collage on an apron, and add a single to the pocket! 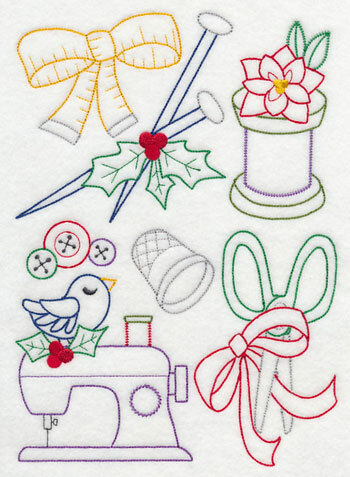 2.79" x 4.96" and 1.97" x 3.50"
4.25" x 3.07" and 2.99" x 2.16"
A medley of sewing notions, decorated with holly and bows! 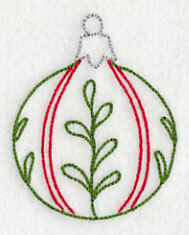 This design will bring a crafty Christmas look to your sewing projects. 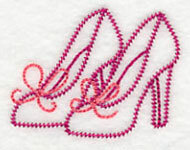 6.90" x 9.66" and 5.86" x 8.20" and 5.57" x 7.80" and 4.86" x 6.80"
The designs from the above collage are also available for individual purchase. 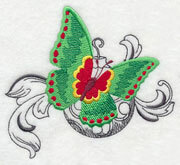 2.17" x 4.21" and 1.53" x 2.97"
3.08" x 5.01" and 2.17" x 3.53"
3.70" x 3.91" and 2.67" x 2.81"
Colorful butterflies land on subtle, sketch-style bulbs. 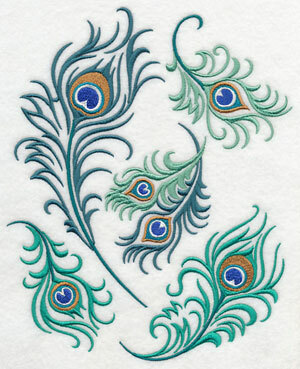 Beautiful on tea towels, table linens, and wall hangings! 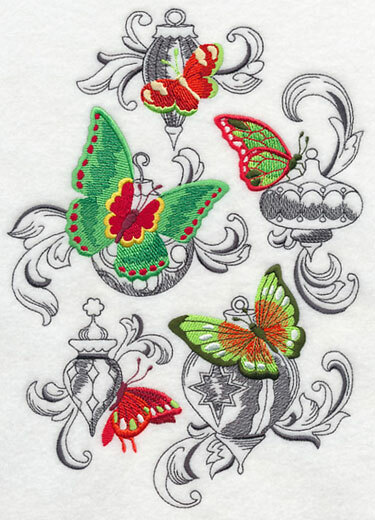 6.90" x 9.59" and 5.60" x 7.78" and 4.85" x 6.74"
Butterflies and bulbs have been separated out of the above collage, and are available for individual purchase. 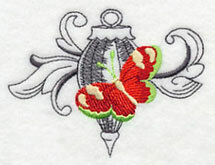 Add to pockets, corners of table runners, napkins, and more! 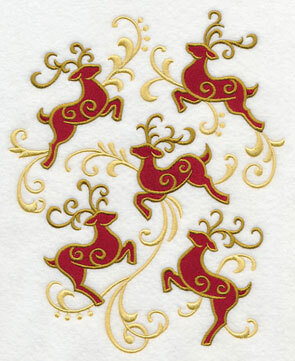 2.92" x 4.63" and 2.05" x 3.26"
3.86" x 4.71" and 2.71" x 3.31"
Customers loved the Reindeer Frolic Border and Corner designs, and asked for more shapes with this style of design. 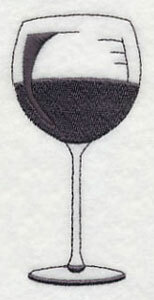 As always, we are happy to oblige! 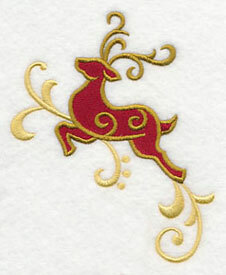 A medley of whirling, swirling reindeer will add energy and style to your Christmas decor. 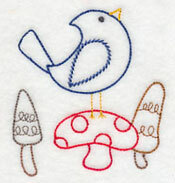 6.90" x 8.60" and 5.85" x 7.30" and 4.78" x 5.97"
The new designs are beautiful additions to linen and tea towels. 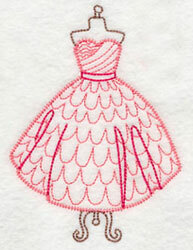 For tips and tricks, see this Fabrics 101 article! 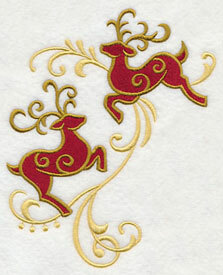 Leaping and jumping reindeer have been separated from the above design, and are available for individual purchase! 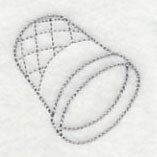 Use in conjunction with the larger design above, or in other projects. 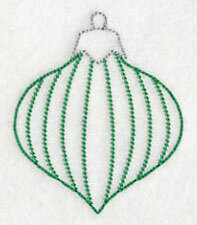 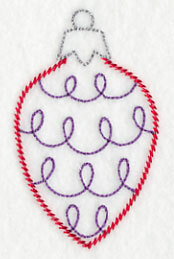 2.54" x 3.41" and 1.77" x 2.37"
Quick-to-stitch ornaments are linked together with a colorful ribbon. 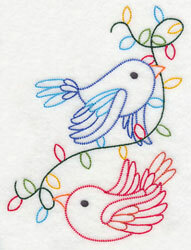 Beautiful on tea towels and quilt blocks! 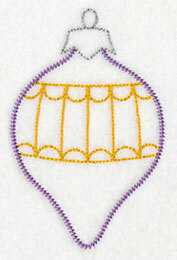 The ornaments from the above design are also available for individual purchase. 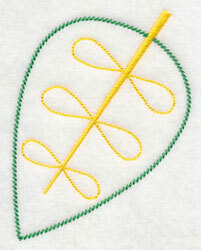 Arrange on a towel or quilt block, then string ribbon to connect them - that will add beautiful depth and dimension! 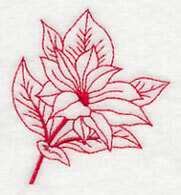 1.50" x 4.61" and 1.10" x 3.31"
2.48" x 2.99" and 1.59" x 1.91"
2.28" x 2.87" and 1.43" x 1.80"
Redwork is a classic addition to holiday home decor. 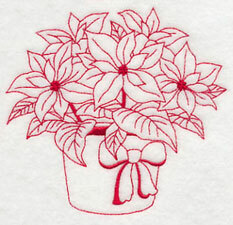 This collage features a variety of poinsettia designs. 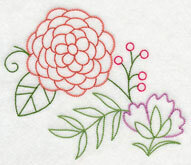 They'll bloom beautifully on quilt blocks, tree skirts, and table linens. 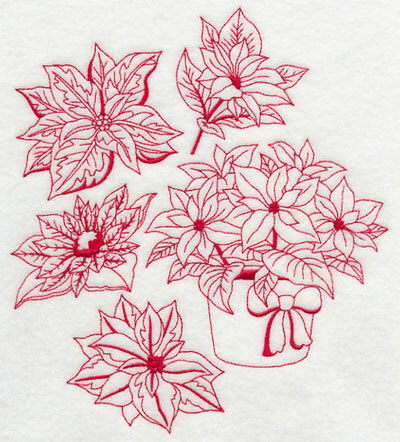 6.90" x 7.76" and 5.83" x 6.57" and 4.85" x 5.46"
The poinsettias from the above collage are also available for individual purchase. 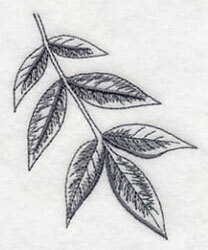 Use in conjunction with the above design, or in separate projects. 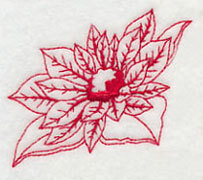 2.66" x 2.31" and 1.87" x 1.62"
2.89" x 2.53" and 2.03" x 1.78"
Winter flowers bloom beautifully from smooth fabrics - tea towels, linen towels, quilt blocks, and pillow covers. 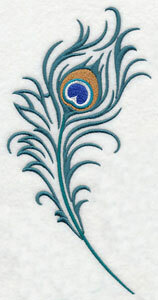 This design uses shades of blue to add interest and eye-catching color. 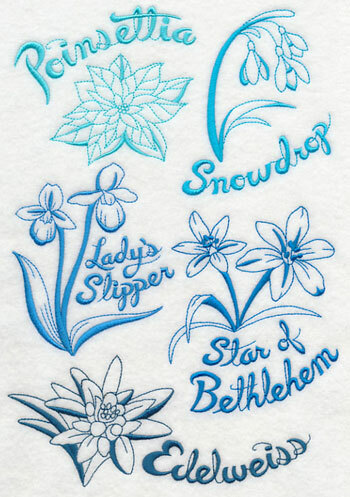 6.91" x 10.02" and 5.86" x 8.49" and 5.36" x 7.77" and 4.73" x 6.85"
The flowers have been separated from the above design and are available for individual purchase. 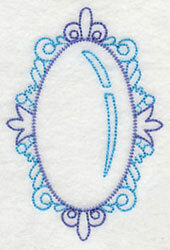 Use in conjunction with the larger design, or in separate projects! 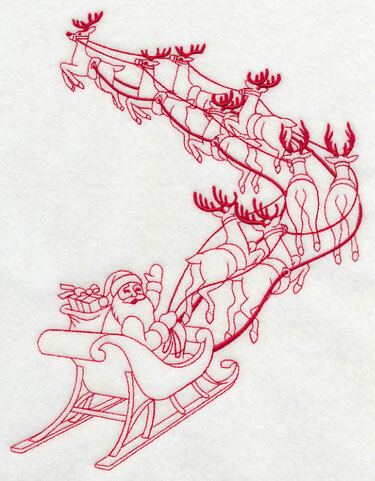 3.37" x 4.01" and 2.31" x 2.74"
6.34" x 2.75" and 3.91" x 1.69"
Santa and his team fly up, up, up and away in this quick-to-stitch Redwork design! 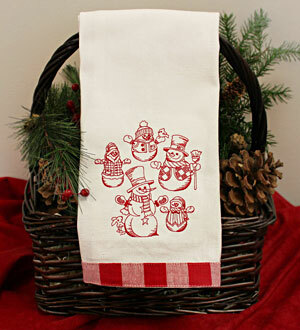 Stylish and seasonal fun on tea towels and table linens. 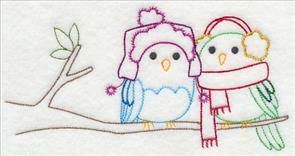 6.91" x 9.03" and 5.86" x 7.66" and 4.81" x 6.29"
A quintet of birds know how to stay warm in the winter temps. 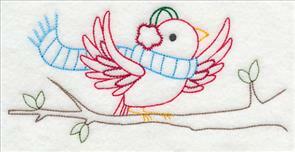 Hats, earmuffs, and scarves, make this group of birds fashionable, even in frosty weather! 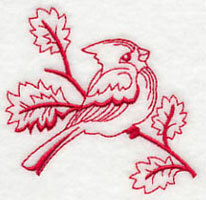 6.89" x 10.19" and 5.86" x 8.67" and 5.29" x 7.82" and 4.65" x 6.89"
The birds and branches are also available as individual designs! 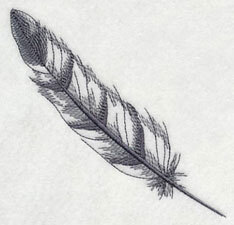 Use in conjunction to the above medley, or on their own in other projects. 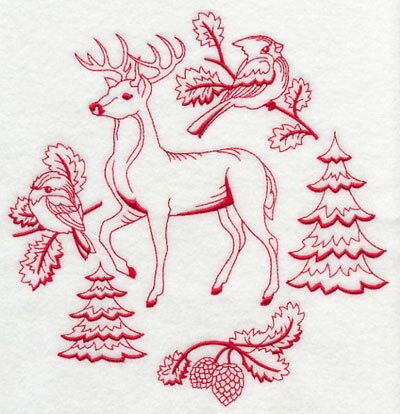 6.65" x 3.24" and 3.81" x 1.86"
6.89" x 3.46" and 3.86" x 1.94"
A flurry of snowflakes is a perfect way to brighten up tea towels, table linens, placemats, and pillow covers. 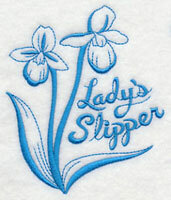 This sample is stitched in frosty blues and silvers - but choose colors that match your personal preference and taste! 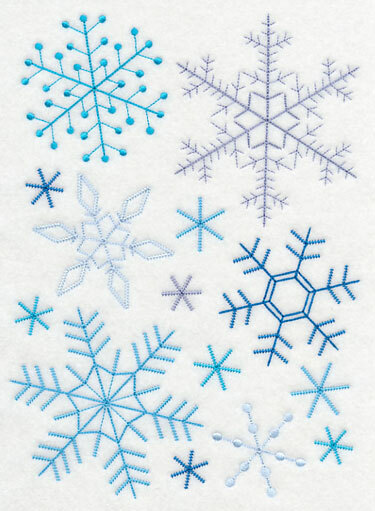 6.88" x 9.55" and 5.60" x 7.77" and 4.85" x 6.73"
The snowflakes from the above medley have been separated out, and are available for individual purchase. 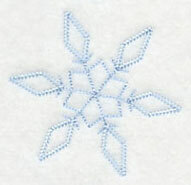 Scatter them on quilt blocks, table linens, shirts, and more, for frosty fashion. 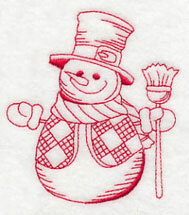 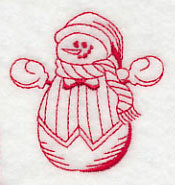 2.79" x 2.63" and 1.97" x 1.85"
3.85" x 3.73" and 2.71" x 2.63"
Quick-stitching Redwork snowman add winter charm to tea towels. 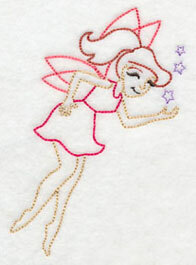 Look for good-quality towels at Target, Kohl's, TJ Maxx, Home Goods - and online sources include All About Blanks, The Sewphisticated Stitcher, Joann's (the Aunt Martha's brand), and Amazon. 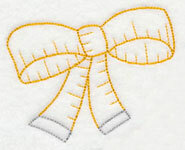 6.90" x 7.53" and 5.85" x 6.39" and 4.85" x 5.30"
Use the tips and tricks in this Fabrics 101 article to get excellent results! 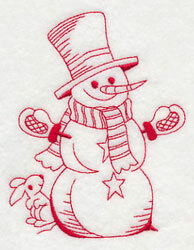 The frosty friends from the above design have been separated out, and are available for individual purchase. 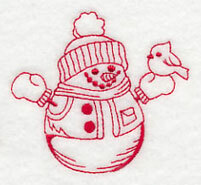 3.29" x 3.65" and 2.32" x 2.56"
2.17" x 2.24" and 1.52" x 1.58"
A vintage-style snowman lifts his arms to the heavens, ready to gather the falling flakes! 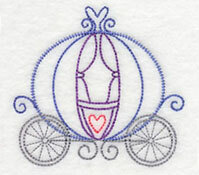 This design is a delightful accent to tea towels, quilt blocks, tote bags, and table linens. 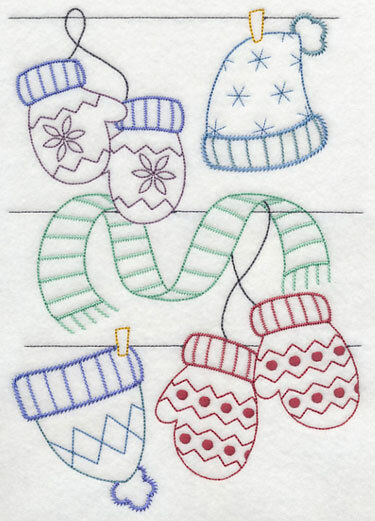 6.88" x 9.93" and 5.86" x 8.46" and 5.42" x 7.83" and 4.76" x 6.87"
Cozy winter gear is hanging from clotheslines. 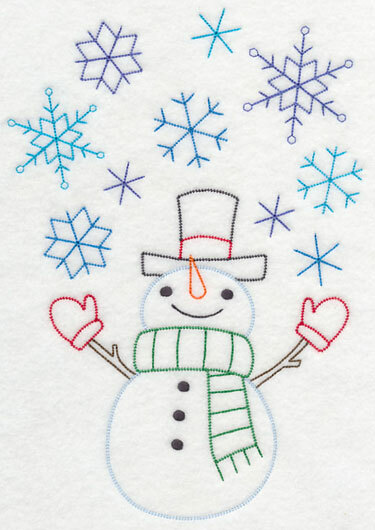 Colorful mittens, hats, and a scarf, are a lovely embellishment to frosty and fashionable towels, table linens, and pillow covers. 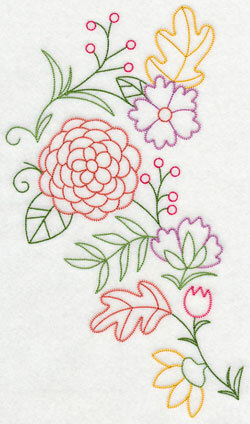 6.88" x 9.74" and 5.51" x 7.81" and 4.83" x 6.86"
This graceful spray of autumn flowers is light and lovely on smooth fabrics. 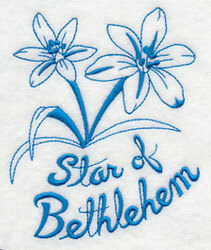 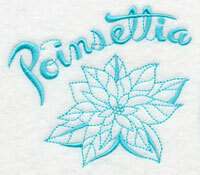 Embroider onto quilter's cotton, pillow cases, bed linens, and table linens, too! 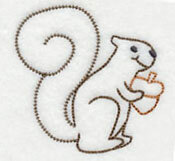 6.79" x 11.75" and 5.46" x 9.43"
4.51" x 7.80" and 3.97" x 6.88"
Find towels at Target, Home Goods, Kohl's, and TJ Maxx. 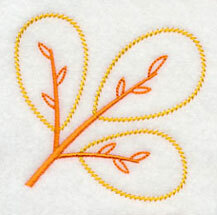 Then, use the tips in this Fabrics 101 article for excellent results! 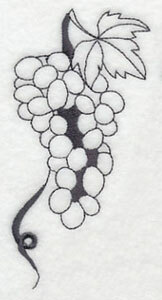 Elements from the above spray have been separated out for individual use. 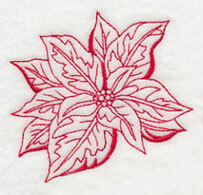 Embroider them in conjunction with the larger spray above, or use them to decorate small areas - pockets and napkins. 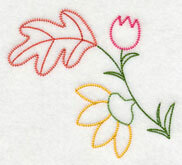 4.41" x 3.94" and 2.59" x 2.31"
Cheerful woodland critters frolic in the autumn leaves and flowers. 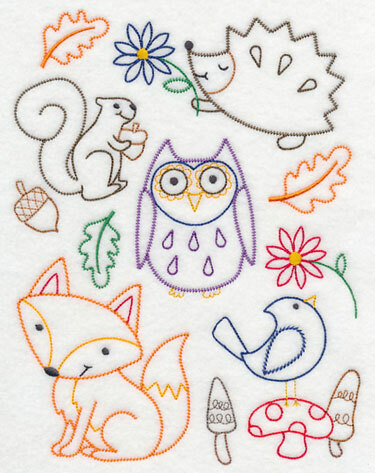 A hedgehog, squirrel, fox, and bird are wreathed in smiles, watched over by a colorful owl. 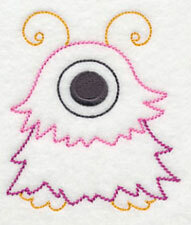 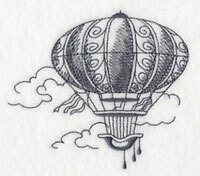 This design brings a spirit of whimsy to embroidery projects! 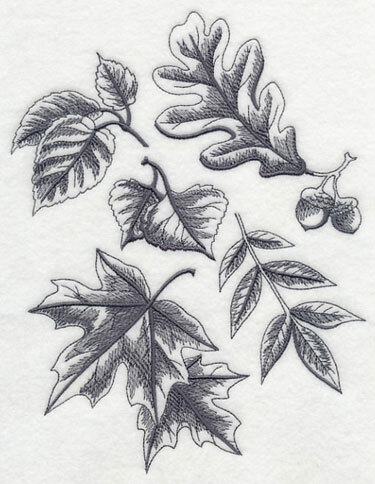 6.88" x 9.17" and 5.84" x 7.78" and 4.84" x 6.44"
Elements from the above collage have been separated and are available for purchase. 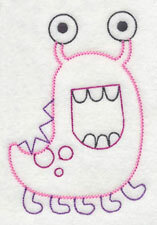 Use in conjunction with the above, or in separate projects! 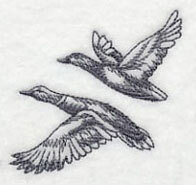 2.44" x 3.19" and 1.73" x 2.24"
2.24" x 2.34" and 1.28" x 1.34"
Northwoods animals, and a pair of mallards, are arranged in an eye-catching composition, and drawn in a light-and-lively sketch style. 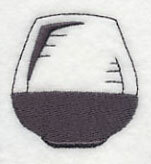 This style has areas of light stitching, or no stitching, so choose smooth, neutral fabrics for excellent results. 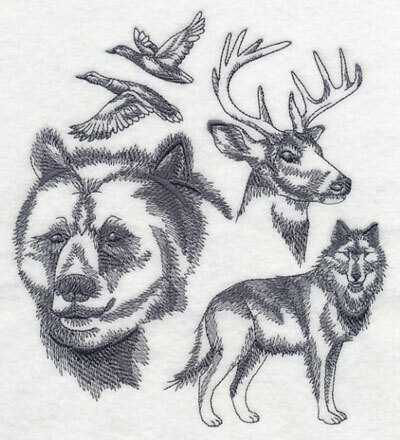 6.88" x 7.55" and 5.89" x 6.49" and 4.87" x 5.32"
The animals and birds from the above design are available for individual purchase. 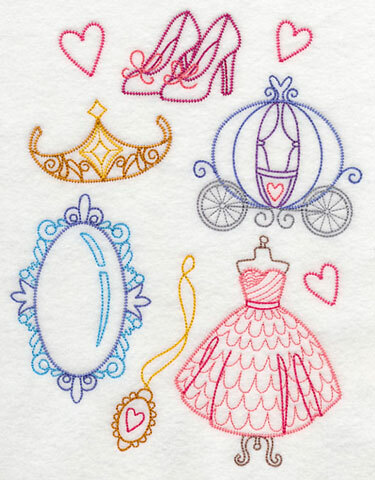 Use in conjunction with the above collage, or in other projects! 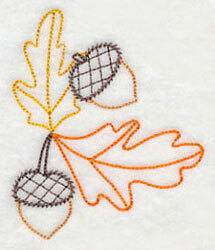 2.84" x 4.37" and 2.00" x 3.05"
4.13" x 3.76" and 2.92" x 2.65"
Autumn, imagined in an avant garde style! 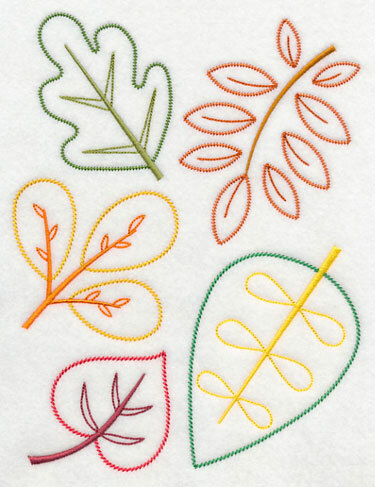 Colorful leaves float down to tea towels, placemats, and quilt blocks. 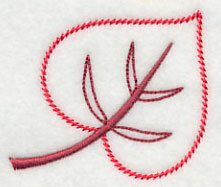 Unique textured stitches add dimension and interest to your projects. 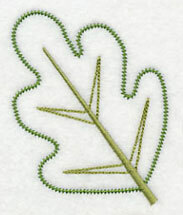 6.88" x 8.97" and 5.88" x 7.66" and 4.84" x 6.30"
Leaves from the above collage have been separated out for individual use. 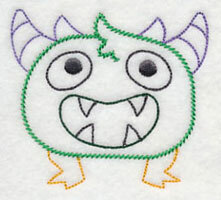 Stitch them in conjunction with the larger design above, or on their own in other projects. 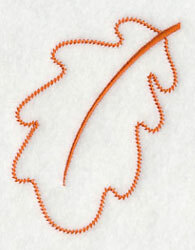 3.28" x 3.21" and 2.32" x 2.27"
3.41" x 4.36" and 2.41" x 3.06"
Autumn leaves are carried on gusty filigree. 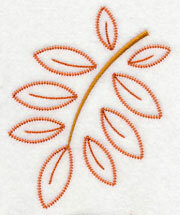 We chose traditional autumn colors for this design, but you can also use shades of green for spring and summer projects. 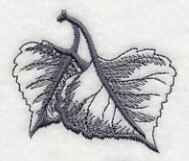 6.93" x 9.34" and 5.81" x 7.83" and 4.86" x 6.55"
The leaves from the above medley have been separated out for individual purchase. 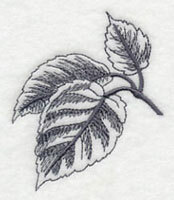 Use in conjunction to the larger design, or on their own in separate projects. 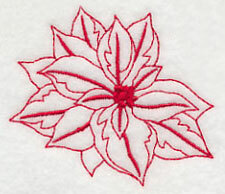 3.44" x 3.32" and 2.44" x 2.35"
3.68" x 4.35" and 2.58" x 3.05"
This sketch-style design is a perfect fit for Thanksgiving projects. 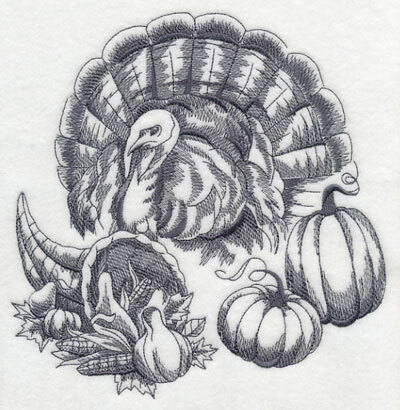 A turkey, cornucopia, and pumpkins are arranged together. 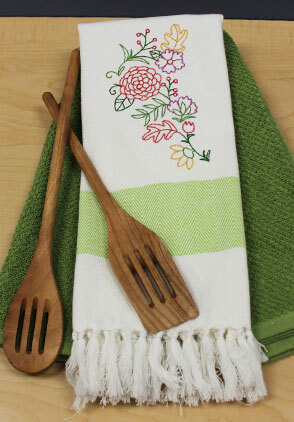 Beautiful on aprons, tea towels, table linens, and placemats. 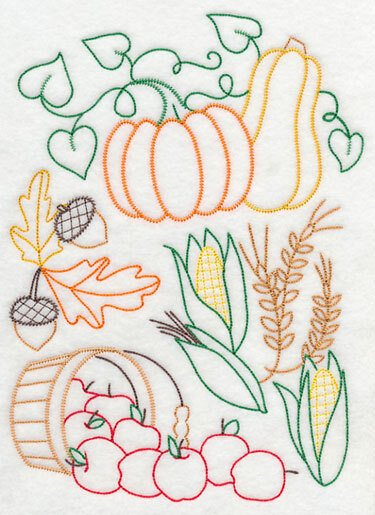 7.59" x 7.80" and 6.90" x 7.09" and 5.87" x 6.03" and 4.85" x 4.98"
A colorful arrangement of autumn's bounty! 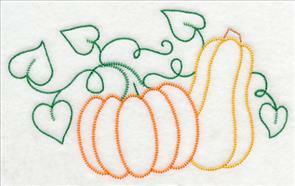 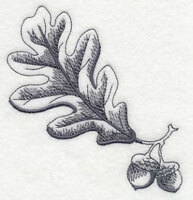 Embroider pumpkins, corn, apples, and acorns onto aprons, tea towels, and table linens. 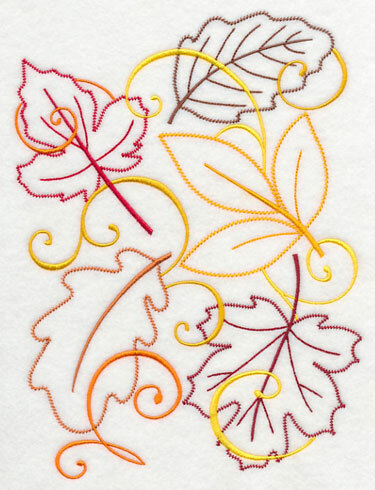 6.91" x 9.59" and 5.62" x 7.80" and 4.86" x 6.75"
The elements of the above collage are also available for individual purchase, too. 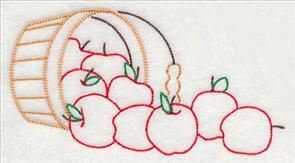 Brighten up apron pockets, linen napkins, and more! 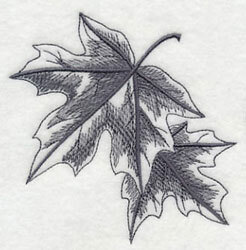 3.02" x 3.58" and 2.12" x 2.52"
4.08" x 5.63" and 2.82" x 3.90"
Birch, oak, cottonwood, ash, and maple leaves are arranged in a beautiful composition. 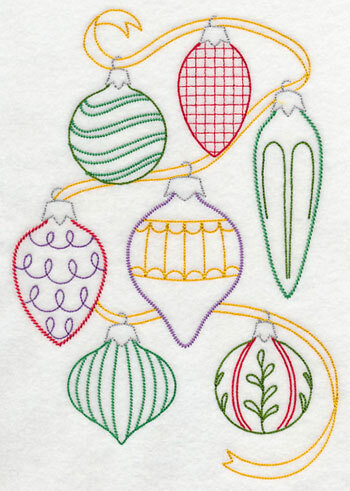 This design is in a light sketch style - there are some light and open areas, so choose smooth, neutral fabrics (tea towels, quilter's cotton, twill, etc.). 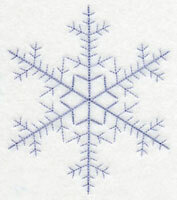 6.90" x 8.87" and 5.86" x 7.53" and 4.86" x 6.25"
Elements from the above medley are available for individual purchase. 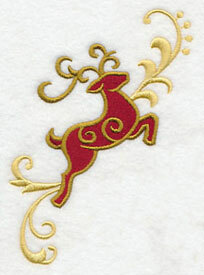 Beautiful on quilt blocks and table linens! 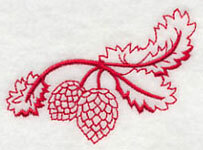 2.30" x 2.00" and 1.62" x 1.41"
4.30" x 4.32" and 3.03" x 3.05"
Embroider this Redwork design onto neutral fabric, then pair it with a wild and woodsy print! 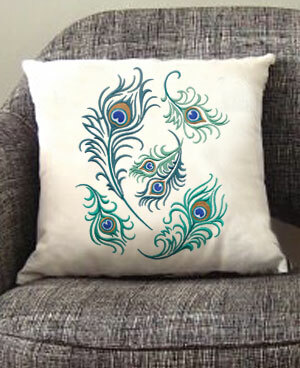 Make pillows, wall hangings, and more, to spruce up cabin decor. 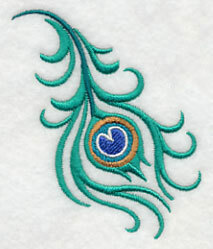 7.54" x 7.80" and 6.91" x 7.15" and 5.89" x 6.09" and 4.86" x 5.03"
Elements from the above design are also available for individual purchase. 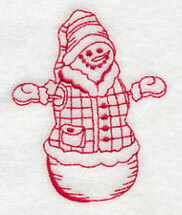 Tuck onto napkins, pockets, and more! 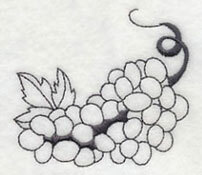 1.86" x 2.94" and 1.20" x 1.90"
2.92" x 2.07" and 1.88" x 1.33"
Wine lovers will adore this design, featuring a variety of grapes, leaves, bottles, and glasses. 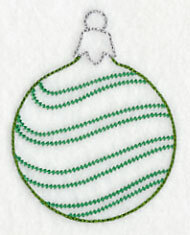 Add to placemats, tote bags, and kitchen wall hangings! 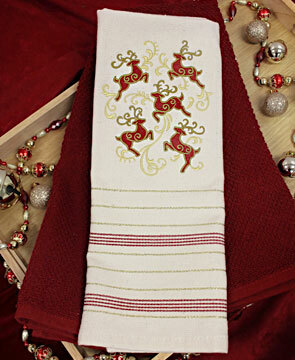 6.89" x 10.04" and 5.87" x 8.56" and 5.37" x 7.82" and 4.73" x 6.89"
Elements from the above design are also available for individual purchase. 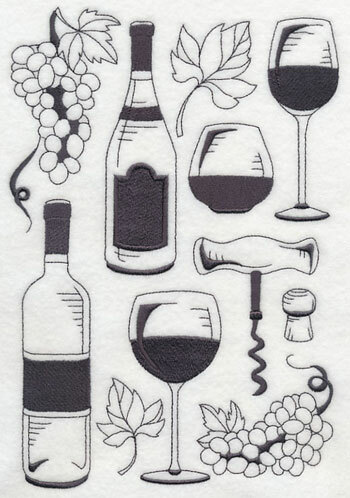 Tuck onto napkins and gift bags for wine! 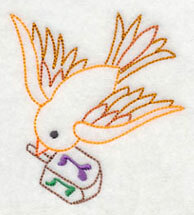 1.48" x 5.30" and 1.02" x 3.63"
1.80" x 1.88" and 1.24" x 1.29"
2.61" x 3.33" and 1.79" x 2.29"
A medley of colorful peacock feathers adds beauty and style to your home decor. 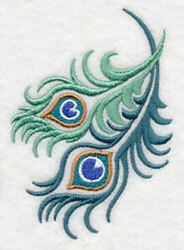 Feathers are arranged in an energetic cascade, with shades of blue-green ranging from bright to dark. 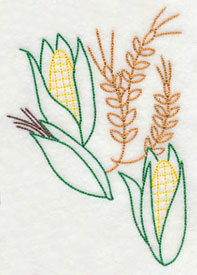 6.89" x 8.60" and 5.86" x 7.31" and 4.86" x 6.07"
Quick stitch collages are perfect for pillow covers! 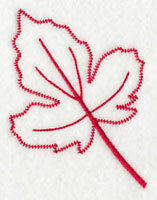 They're a snap to stitch and add long-lasting appeal to home decor. 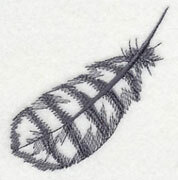 The feathers from the above design have been separated, and are offered for sale individually here. 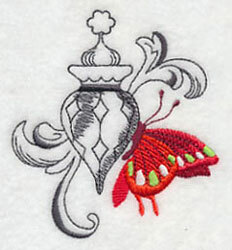 Use in conjunction with the larger design, or on their own in other projects. 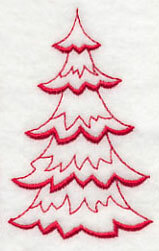 2.60" x 3.74" and 1.83" x 2.64"
3.90" x 3.87" and 2.80" x 2.79"
together in a stylish display. 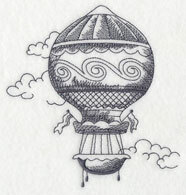 This design is in a sketch style, so there are light and open areas. 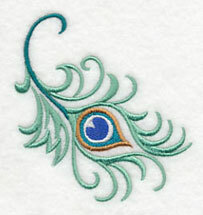 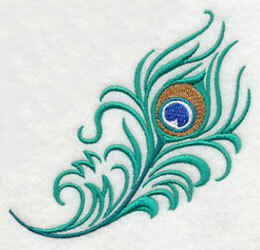 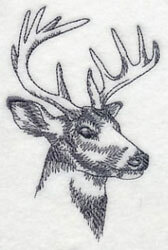 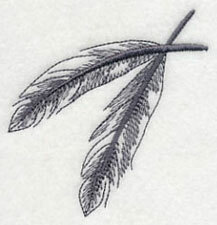 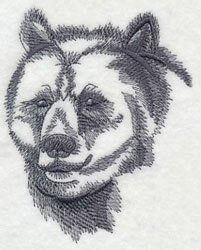 Embroider onto smooth fabrics (twill, linen, quilter's cotton) for excellent results. 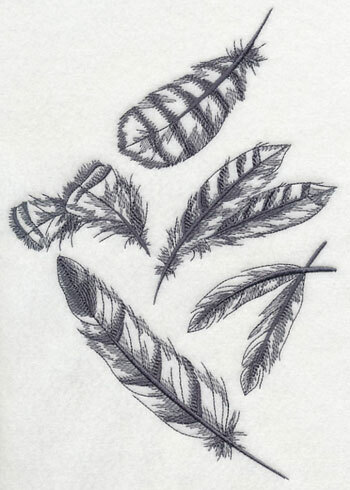 6.90" x 9.79" and 5.52" x 7.78" and 4.83" x 6.85"
Feathers from the above design have been separated out, and are available for individual purchase. 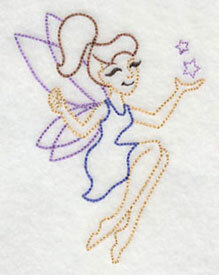 3.90" x 3.24" and 2.76" x 2.30"
4.66" x 4.86" and 3.26" x 3.41"
The elements of a fairy tale with a happy ending are in this medley design. 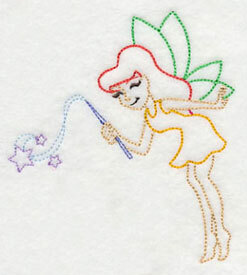 Embroider onto quilts and pillowcases for dreamy results! 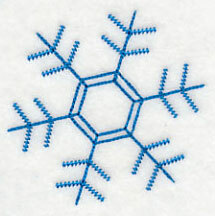 6.90" x 8.97" and 5.86" x 7.60" and 4.84" x 6.27"
Elements from the above design have been separated out, and are available for individual purchase. 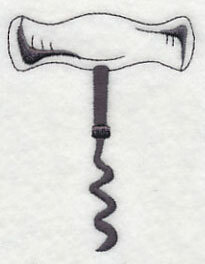 3.37" x 3.15" and 2.36" x 2.21"
3.37" x 4.57" and 2.37" x 3.20"
Up, up, and away! 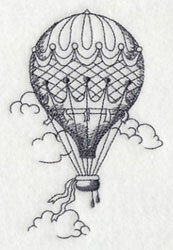 Old-time hot air balloons rise up among the clouds. 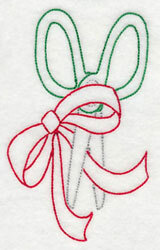 Add a classic look to quilt blocks and tea towels with this light, sketch-style design. 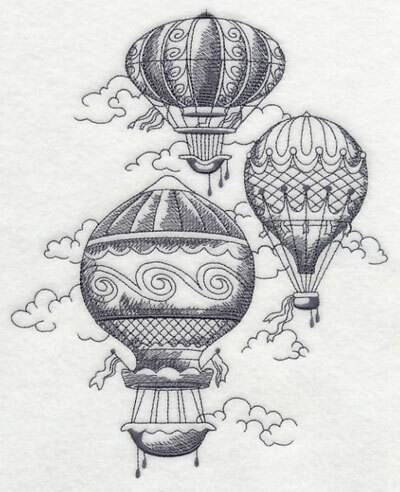 6.90" x 8.55" and 5.85" x 7.25" and 4.85" x 6.02"
The hot air balloons from the above design have been separated out, and are available for individual purchase. 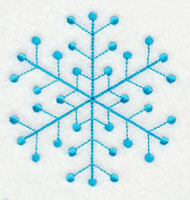 4.87" x 5.13" and 3.68" x 3.88"
Get your motors running! 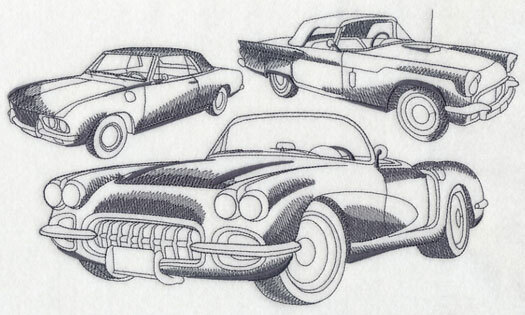 A trio of classic cars is fun on pillow covers and tote bags. 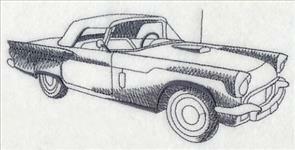 And, you can turn a plain ol' tea towel into a T-bird towel with this collage! 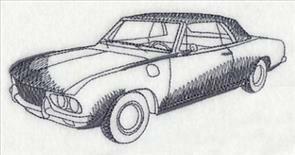 11.75" x 6.82" and 9.40" x 5.46" and 7.80" x 4.53" and 6.85" x 3.98"
The classic cars from the above design have been separated out, and are available for individual purchase. 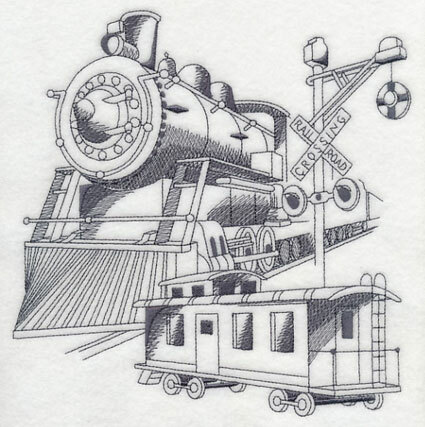 5.44" x 2.57" and 3.61" x 1.71"
6.45" x 3.08" and 3.85" x 1.84"
This railroad collage features an engine, caboose, and crossing sign. 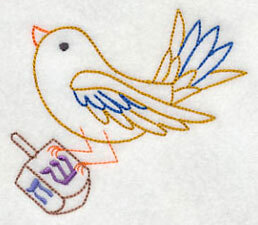 Embroider it for the engineers and conductors in your life! 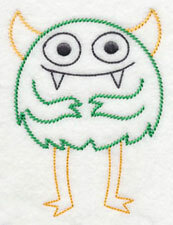 7.70" x 7.80" and 6.90" x 6.99" and 5.84" x 5.92" and 4.85" x 4.91"
Colorful, friendly monsters bring the sweetest of dreams. 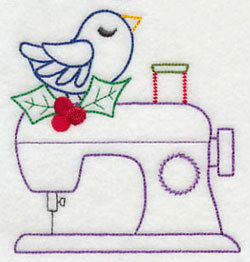 Add to quilts and pillowcases! 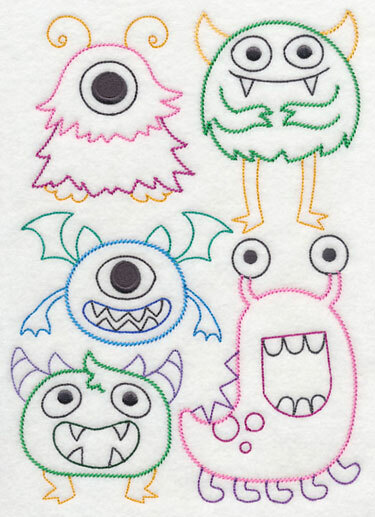 6.88" x 9.71" and 5.51" x 7.79" and 4.84" x 6.83"
The colorful monsters from the above design have been separated out, and are available for individual purchase. 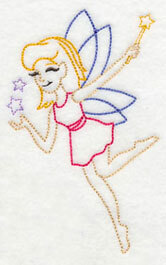 3.60" x 5.25" and 2.54" x 3.69"
3.36" x 3.06" and 2.36" x 2.16"
Fairies sprinkle magic dust and stars onto sleeping children. 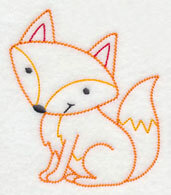 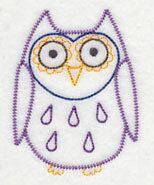 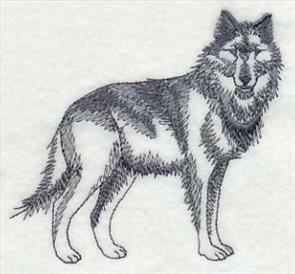 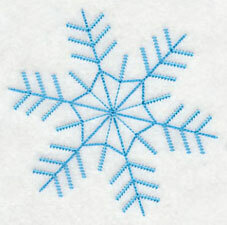 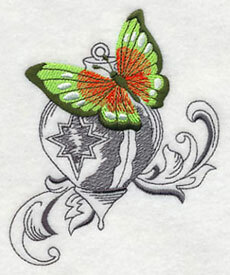 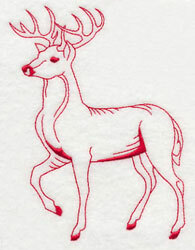 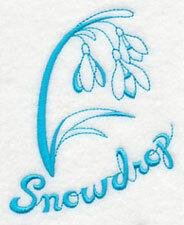 Embroider this design onto quilts, pillowcases, and pillow covers, and brighten up a child's room. 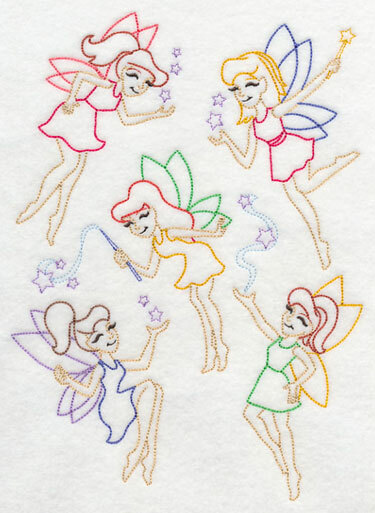 6.90" x 9.41" and 5.72" x 7.80" and 4.83" x 6.59"
The fairies from the above design have been separated out, and are available for individual purchase. 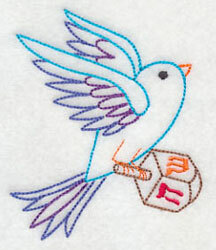 2.57" x 5.93" and 1.69" x 3.90"
2.88" x 3.90" and 2.05" x 2.86"
Add color and charm to Chanukah gifts with this design! 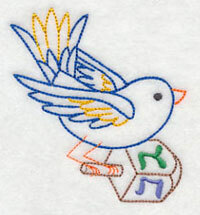 Cheery birds carry dreidels, wonderful on tea towels, table linens, and aprons. 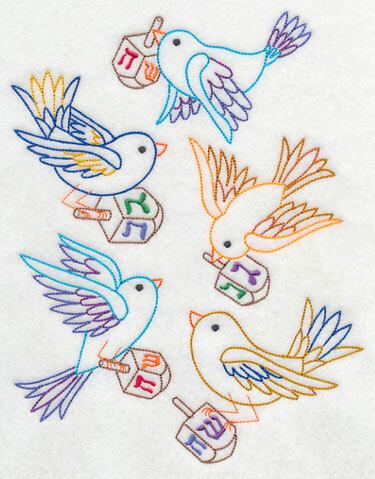 6.90" x 8.76" and 5.86" x 7.44" and 4.89" x 6.21"
The birds carrying dreidels have been separated from the above design, and are available for individual purchase! 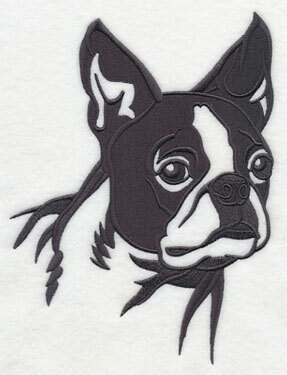 3.02" x 3.29" and 2.14" x 2.34"
3.72" x 3.23" and 2.64" x 2.29"
Jerri, Marlena, Sarah, Carla, Robyne - the list is so long - and other embroiderers have requested a Boston Terrier as the request of the week. 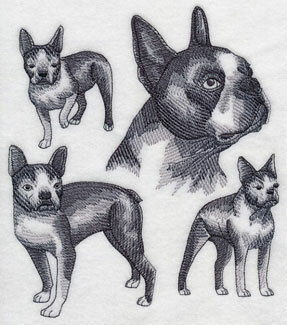 New head silhouettes and sketch designs are wonderful on totes, shirts, pillows, and other dog-lover gifts. 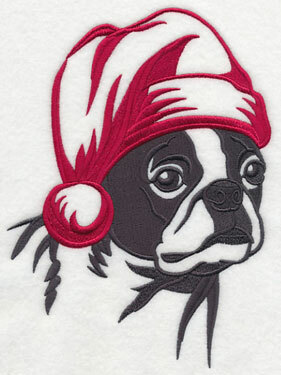 A few months ago we put a Santa hat on a pug here and here, and requests came pouring in for more - especially the Boston Terrier. 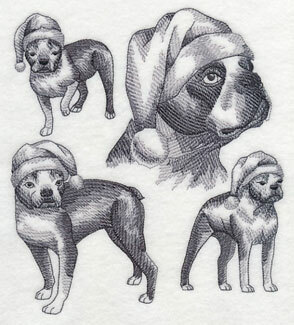 Add Christmas spirit to dog stockings with these holly-jolly designs! 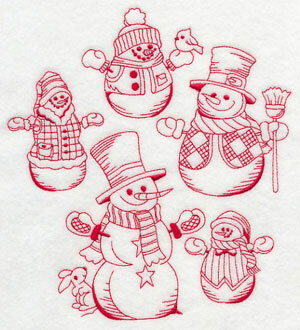 5.86" x 7.92" and 4.84" x 6.53" and 2.86" x 3.86"
6.87" x 7.80" and 6.08" x 6.90"
6.88" x 7.63" and 5.84" x 6.47" and 4.85" x 5.37"